Earlier this week I had the good fortune to attend the Annual Lecture of the Center for the History of Print and Digital Culture at the School of Library and Information Studies at the School of Library and Information Studies at the University of Wisconsin - Madison. This year it featured Sarah Wadsworth, Associate Professor of English at Marquette University, and Wayne Wiegand, Professor Emeritus at Florida State University, talking about their new book Right Here I See My Own Books: A Woman's Building Library at the World's Columbian Exposition (Univ. of Massachusetts Press, 2012). The Woman's Building Library came on my radar screen in 2006 with a special issue (Winter issue) of Libraries & Culture which was devoted to the library and was edited by Sarah Wadsworth. The library consisted of over 8,000 volumes from around the world written, illustrated, edited, or translated in the 400 years leading up to the exposition. In the "Acknowledgments" section of the new Wadsworth and Wiegand book, the development of the book is chronicled. 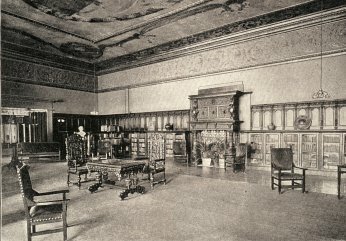 It began with Wiegand's discovery of a cache of letters between Melvil Dewey and Bertha Honore Palmer, chair of the Board of Lady Managers of the World's Columbian Exposition and the driving force behind a Woman's Building at the Exposition, while doing research on his biography of Dewey at Columbia University in the early 1980s. Wadsworth joined with Wiegand in 2000 to pursue the project because of her interest in nineteenth-century American women's literature. Together they obtained a grant to create a relational database of the contents of the Woman's Building Library. That relational database is now available online at Marquette University. I found the book that Wadsworth and Wiegand produced after years of effort and research to be extremely interesting and I recommend it highly. I found the portion of the book related to Melvil Dewey's involvement with the Woman's Building Library and its staffing with "Dewey's girls" to be especially interesting. Wadsworth and Wiegand are donating the royalties from their book to the National Women's History Museum. They have been lecturing about the book around the country. An interesting blog post about the kick-off of their lecture tour at the Library of Congress is located HERE. I wrote a previous blog post about the library that featured a postal card in my postal librariana collection in 2009.